Nitrous Outlet EFI single nozzle systems come with more jets to set horsepower exactly where you want it. They include everything needed to add horsepower to your late model EFI vehicle--hardware, wiring, jetting, solenoids, hoses, and a nozzle. They also include a wide-open throttle (WOT) switch that only allows the systems to be activated when the motor is at full throttle. This feature will help in preventing engine damage and lean spikes. 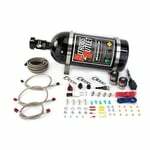 Get Nitrous Express race-proven systems because of their quality components and extreme performance. Delivery Style: Air intake tube. Jet Sizes Included (hp): 35, 50, 75, 100, 150, 200. All of the products sold by Nitrous Outlet, regardless of the manufacturer, are designed for racing and performance applications. Many of our manufacturers offer NO WARRANTY on their products, either stated or implied, due to the unusual stresses placed on the parts and because we have no control over how they are installed and used. Many of these products are designed for off-road use only are are not legal for use on public highways.